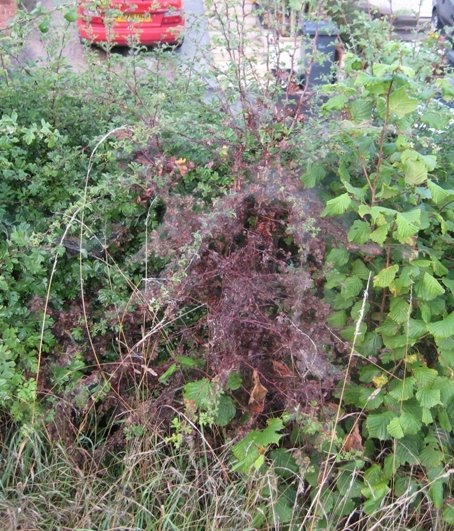 You may have notice two bushes, 1 hawthorn and 1 blackthorn looking very dead and covered in what looks like cobwebs along the Greendown hedge. From my initial google it looks this has been caused by the orchard ermine moth http://www.butterfly-conservation.org/uploads/BC%20web%20site%20-%20Ermine%20moths%20update(2).pdf and does not seem to be something to get very worried about. I will go up later, take photos and see if I can find some caterpillars. 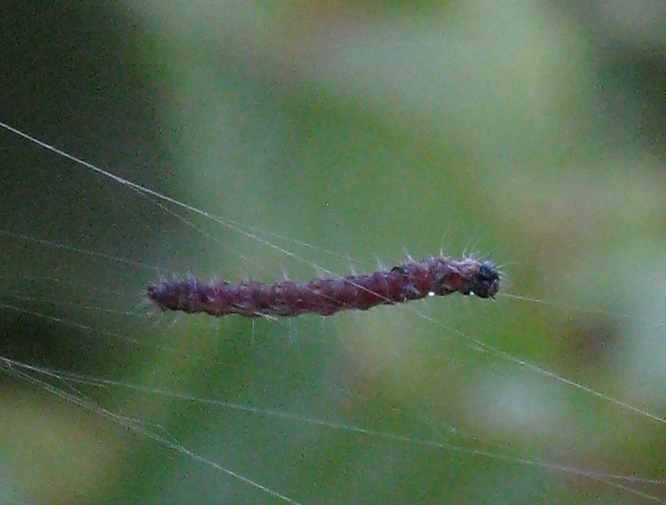 Well, I went back and I managed to crack how to use the macro feature on my camera but the caterpillar I have photographed does not look the same as the photos of the orchard ermine moth I found here http://ukmoths.org.uk/show.php?id=3251. I think I will be emailing a couple of people with moth knowledge to try to find out what it is. If anyone viewing this knows the answer please let me know. 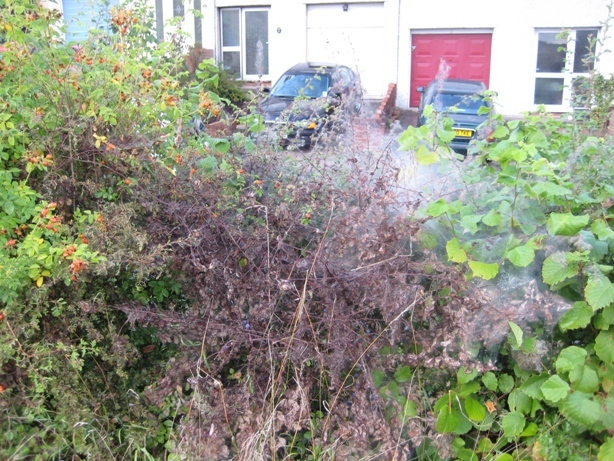 Photos below of the webby hawthorn and blackthorn and the caterpillar. It's not the lackey moth or the magpie moth. I took another photo today to give an idea of scale against Rob's finger. They are about 1 cm long and at most 2mm wide. 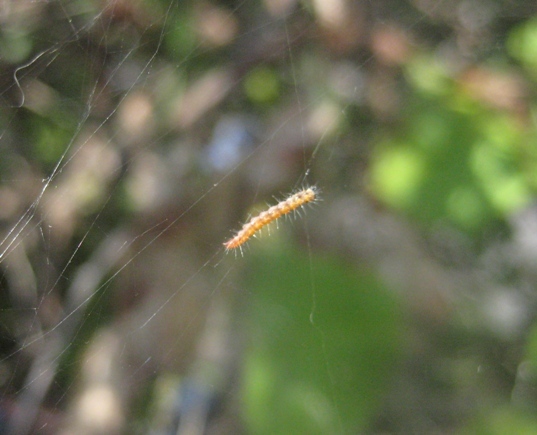 "They are a species of Yponomeuta, or ermine, small white micro-moths with black spots, but I'm not sure which one. 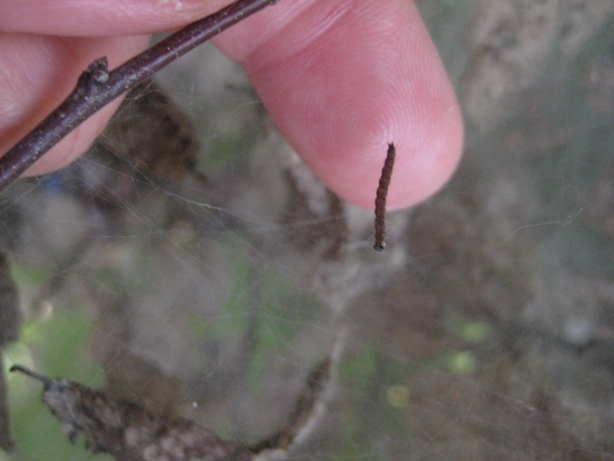 They had an excellent spring this year for some reason, so infestations of this scale were widespread. In all likelihood they'll be much scarcer next year. They're nothing to worry about from a safety point of view." Many thanks to Rupert and Jan.